We'll clean your heat exchanger, combustion chamber, burners, jets, pilot light, blower motor, fan, and filter. We'll check the evaporator coil (A-coil) for proper air flow, check the contacts and wiring, check the blower motor for proper functioning, check the igniter and flame sensor for wear, check the condensation drain coil line for clogs, and look for any filter bypass issues. Furnace not working? Though there is some minor overlap between cleaning and repair, if your furnace is not working, the diagnosis should come from a licensed HVAC repair company. The main aim of furnace cleaning is maintenance and indoor air quality. Although the air entering passes through a filter, the filter cannot possibly remove everything, and over time its tiny holes become choked with dirt. Additionally, the internal parts of the furnace (blower, motor, fan, etc.) become dirty themselves, and this dirt gets caught up in the system and blown back into your home. An improperly cleaned and maintained furnace can also be dangerous. Carbon monoxide is a natural product of combustion and is found in combustion fumes, such as those produced by oil or gas furnaces. These fumes are normally exhausted from your home through the furnace's venting. A clean, well-maintained, and efficiently burning furnace will produce less carbon monoxide than a dirty one. For further reading, visit our blog post: The Importance of Furnace Flue Cleaning. ​Clean the blower and fan compartment, removing all dust and debris from the fan blades, which helps prevent the blower motor from burning out. Ensure the blower motor is functioning as it should, and that the evaporator coil (A-coil) is allowing proper air flow. Check the contacts and wiring, and the ignitor and flame sensor for wear. Examine the condensation drain coil line to make sure it's free from clogs (which, if present, could cause water to leak down into your furnace). 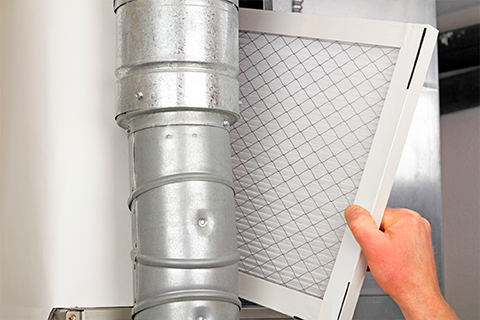 Look for a common problem referred to as "filter bypass," which allows dust and contaminants to sneak around your furnace filter and into your home. This often happens when an ill-fitting or cheap furnace filter is used, or, in some cases, improper installation of the filter rack. If this condition is present, the technician can offer some suggestions for alleviating filter bypass. ​For further reading, visit our blog post: 5 Situations That Call For a Furnace Cleaning. Many people are unsure whether their home is heated by a furnace or a boiler. This is an important piece of information, as the two work in completely different ways and are often serviced by different technicians. The most fundamental difference is that a furnace uses heated air to provide warmth to your home, and a boiler uses heated water. The distribution system for a furnace is comprised of ductwork and vents, and the distribution system for a boiler is a network of pipes, through which heated water is pumped to either radiators, baseboard heaters, or radiant flooring. Do you have air vents from which hot air blows? You have a furnace. Does your home have radiators? You have a boiler. ​Need a boiler cleaning? Visit our Services page.